Имате въпрос към New World Beijing Hotel? Построен през 2013, New World Beijing Hotel е важно допълнение към Пекин и разумен избор за пътуващи. Този 5-звезден хотел е леснодостъпен, тъй като е само на 35 km от летището. Този модерен хотел се намира в непосредствена близост до известни градски забележителности като например Подземен град, XianYuKou MeiShiJie, Beijing Urban Planning Exhibition Hall. В New World Beijing Hotel отличното обслужване и достъпните съоръжения допринасят за Вашия незабравим престой. Докато са отседнали в този чудесен хотел, гостите могат да се насладят на 24-часов рум-сервиз, безплатен WiFi достъп във всички стаи, 24-часова рецепция, съоръжения за инвалиди, експресно настаняване/напускане. Дизайнът на хотела е съобразен с най-високите изисквания за удобство и комфорт, осигурявани от съоръжения достъпни в някои стаи като телевизор с плосък екран, почистващи препарати, безплатно разтворимо кафе, безплатен чай, огледало. Възможностите за отдих, които хотелът предлага са фитнес зала, сауна, закрит басейн, спа, масаж, които също предоставят бягство от ежедневието и предразполагат за пълна почивка. Насладете се на несравнимото качество на услугите и престижното местоположение на New World Beijing Hotel. Arrived at night for check in and front desk staff offered upgrade to suite. Thanks! Though we hardly spend much time in the hotel😄 spacious suite, living room with Nespresso machine and Chinese tea with tea set, bedroom with large TV en-suite including large bathtub (with its own TV I think) and separate rain shower. All amenities including bathrobes. Automatic blinds. Good spread of international buffet. My partner and I absolutely loved staying at New World. Everything about the hotel exceeded our expectations, from our free room upgrade to the pool and gym facilities, we could not fault it. My partner even got a surprise bday cake delivered to our room for his bday, amazing and outstanding service! We also loved the buffet breakfast , buffet dinner and the rooftop bar! Thank you New World, we highly recommend this hotel. The hotel stay was awesome. The only room of improvement was the breakfast, but it's quite subjective in commenting on food as some people feels it's within their expectation. For the facilities, the gym room was clean and well equipped, the indoor swimming pool makes some point to swim during the winter although the chlorine smell a bit strong. So far, i will still recommend and revisit if there's any chance back in Beijing. Room is spacious, clean and cosy. Buffet breakfast had mixtures of chinese and western. I would recommend trying their buffet dinner which was very affordable for the spread. Great facilities with indoor heated pool which was great for winter. Our stay was in Dec 2018 for 7 nights. The room was impressive and the bed was large enough to accommodate three people even though it was only two of us. The room was very spacious and it was enough to set down our luggage on the floor and yet have ample space to move and lounge around. The Nespresso machine was a nice touch for a morning coffee and they even left us a bucket of ice for our evening drinks each night. Room was clean and they replaced our towels everyday and topped up the toiletries. Facilities were impressive and true to the pictures. The lunch and dinner buffets on the first floor were value-for-money on cold nights in Beijing and they had free flow alcohol for a small additional fee. Other than that, the hotel was well-connected by bus and train to most sights in the city. Shopping malls were about a 10 mins walk away with plenty of food - local and international - around the corner. When we checked in, we were told the room was not ready, and it might need to take a while. We were okay with that and asked how long it would take. The front desk staff said 5 mins to 1 hour. That was a huge difference, 5 mins and 60 mins. We assumed they would still need 1 hour to clean the room, so we asked to leave our luggages at front desk and come back later. It was just 3 mins later, when we were ready to leave, he told us the room was ready and we could take an elevator to our room. So unprofessional! We went down stairs at 6AM and requested a cab to South Station at 6:50AM. When we finished our breakfast at 6:46AM and asked the front desk if our cab is ready. We knew he completely forgot our cab by his reaction. It was the same front desk staff who wrote down our request on the note. Unbelievable! We were almost late for our train. Almost! 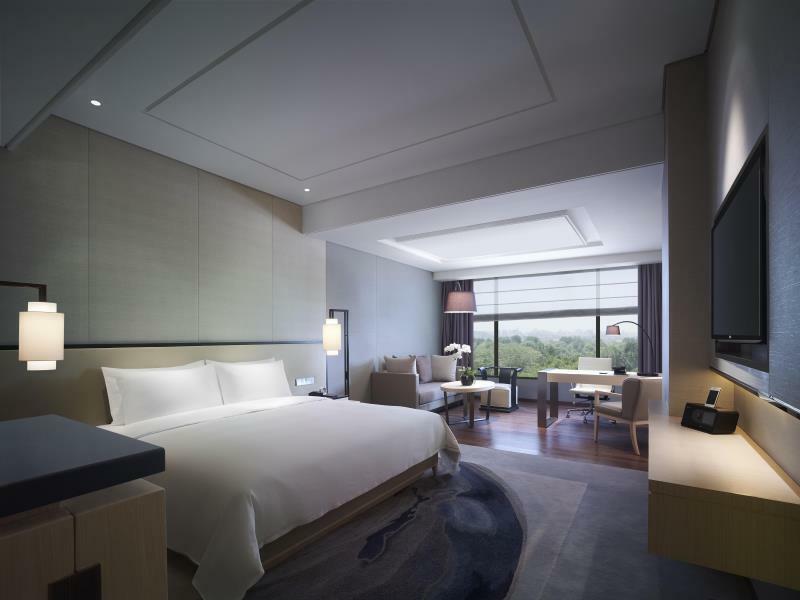 Extremely nice hotel in central beijing city, close to the metro and wangfujing walk street (shopping) and many resturants ect. Room was amazing, large bed with gorgeous bathroom ensuite and everything was spotlessly clean Pool and spa area were great and the breakfast buffet was delicious. Excellent facilities with very helpful staff. The Residence Club upgrade is fantastic, it was lovely being able to go and get a complimentary drink and nibbles at the end of a long day of sightseeing. The rooftop area is a great place to watch the sunset. We stayed 4 nights and the bed was too hard making it hard to sleep comfortably. We are also still waiting to be refunded a very large holding deposit which is disappointing. Club access was great as their drinks and snacks were very nice and the view from the roof bar was great. Rooms were very nice and clean. Hotel breakfast was good quality and mix of western and local. Kids and adults were happy. New World Beijing is by far the most impressive hotel I have ever stayed at. Everything from check in to check out was seamless. When we first booked the resident club king room through Agoda, we were given regular king room due to an error on agoda's part. We explained the situation to the general manager at New World Mr. Sarton who promptly helped us resolve the issue, whereas Agoda was no help at all and even wanted me to pay for the upgrade fee myself at first. The staff at New World Hotel was exceptional. The Club rooms are absolutely worth it. You get to eat your breakfast in a much more spacious space. Besides, it comes with happy hour everyday from 5:30-7:30! 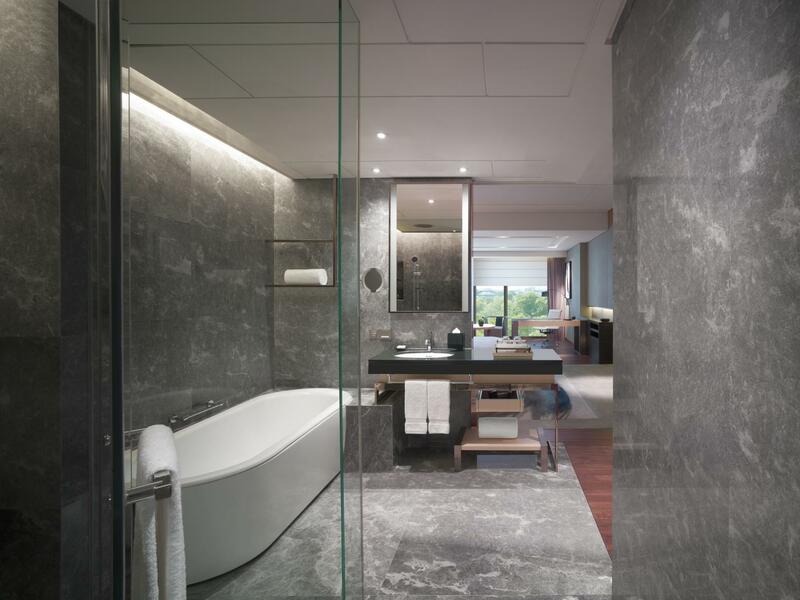 The room themselves are modern, clean, and pleasantly designed featuring an open bathroom connected to the main bedroom. Our room also had a huge window overlooking Beijing. It is about a 5 minute walk to ChongWenMen station, extremely convenient. Book now if you are coming to Beijing! We stayed for 2 nights and got an upgrade to a deluxe room when we checked in. The hotel is approximately 12 mins walk to Tiananmen Square and less than 10 mins walk to Chongwenmen Underground station. The buffet breakfast is good. All staff we met at the hotel cafe, reception, concierge and housekeeping are very polite, attentive and efficient. It is a very good, clean and well located hotel. There are many eateries nearby. We will definitely stay in this hotel again when we visit Beijing! Thumbs up for the service provided by the hotel, every request was granted and beyond expectations. No flaw about this hotel. But about agoda booking agent- I am very disappointed. I prepaid a residential club room with higher room rate, but agoda only booked a standard twin room for me. This is my second similar bad experience with agoda, I will not hesitate to book with other booking agency in the future. it is a well facilitated hotel with great services. The room is large and comfortable. I stayed at an executive room where a coffee machine was avialuable, making my stay quite perfect.... The excutive lounge is OK but it wasn't worth of the money spend. Anyway, it is great hotel and i will be back again. 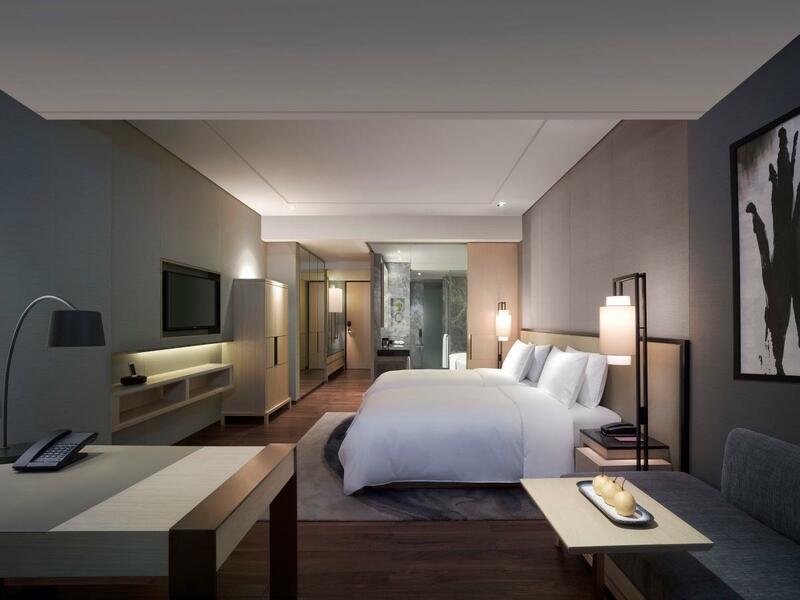 The New World Beijing is a graciously staffed modern hotel super convenient for Tiananmen Square and the Forbidden City, Dashilan neighborhood via quaint hutong area, Wanfujiang shopping street, and all the rest of Beijing via the 2 and 5 subway lines. The pool and gym are top-notch. We started every day with some laps, a hot tub, and a steam before descending upon the breakfast like a swarm of locusts. The buffet offered a large variety of both Chinese and western food, thoughtfully prepared and serviced by an attentive staff. We could not be happier with our choice of hotel. Very beautiful hotel, quiet and comfortable. But when I called for additional bottled drinking water, I had to call 3 times, and the third time, housekeeping brought 2 bottles and when I asked for a few more , she replied with " you should have told me earlier ", in mandarin. I replied saying, I told the telephone operator! If not for this experience with the housekeeping, it would have otherwise been a perfect stay. I arrived at midnight, so checkin was fast, but when I was checking out , I was in line for almost an hour, they only had two staffs working there, some customers were checking in, some were checking out, this part I think is totally ridiculous considering is a five star hotel. It is new and clean. Rooms are quiet and well maintained. Location to the malls (nice restaurants are always at the top floor of the malls) and subway is only a 15 walk away. I liked it so much I stayed here twice., once in 2016 and once in 2017 and did not even bother with other hotels.